Good afternoon from Austin, Texas! 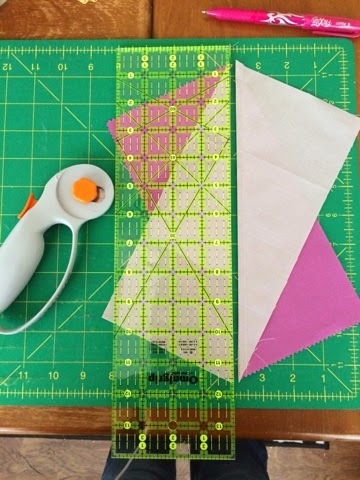 It's only fitting that here at QuiltCon writing this tutorial, isn't it? 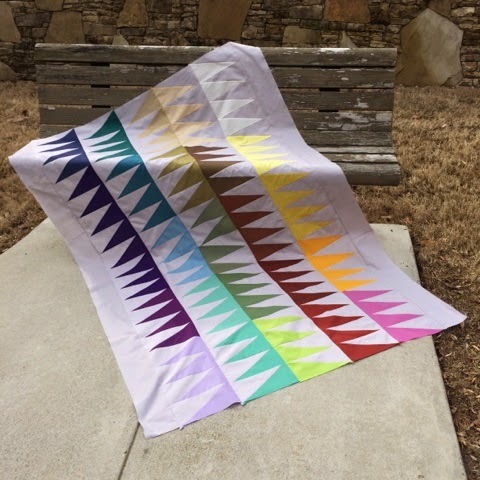 Last week, I made this quilt top from an Oakshott 10" square pack of colors 31-57 and 2 1/2 yards of background fabric, color number 32 Amalfi ) which has a grey warp and a white weft.) I LOVE shot cottons, they have such a nice weight and feel to them, almost like linen but with crisp softness that doesn't wrinkle quite as much. They also have a really lovely vibrant, subtle color shift in them. This is because they're woven one direction (warp) in one color and the other direction (weft) in a second color. 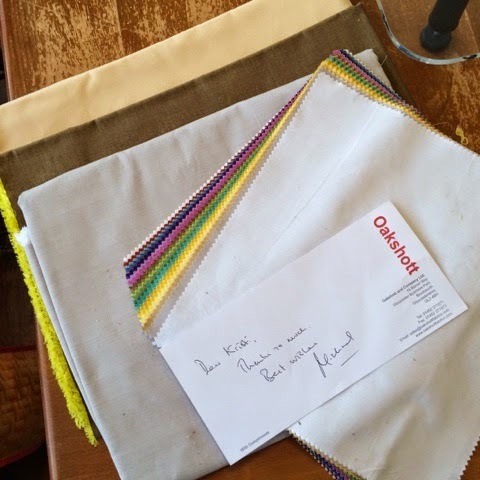 The result is a fabric that blends beautifully with other fabrics in a way that an ordinary solid fabric wouldn't. As you can see in the above photo, I was given plenty to work with. 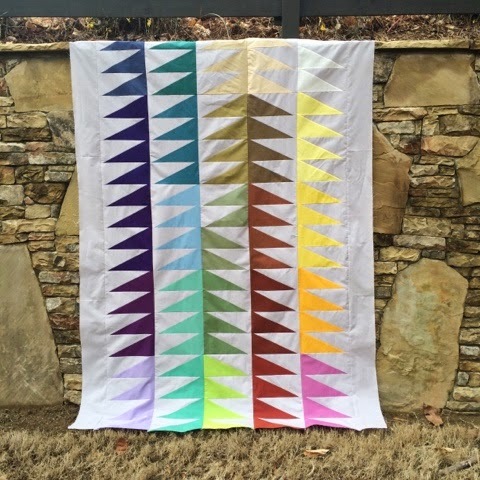 I wanted to create a quilt that was not only a challenge for me, but also something that would showcase just how incredibly colorful and gorgeous this fabric is. I didn't really have a plan, I almost never do when it comes to my quilts. Instead, I laid the fabrics out on my design wall and let them speak to me. 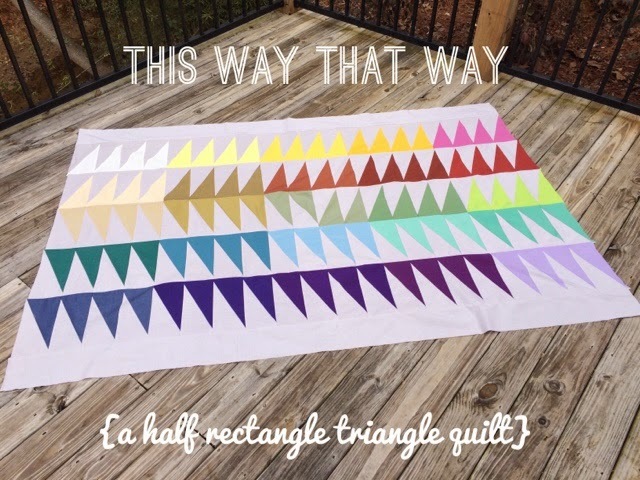 I loved how each color complimented the others, so I knew I needed to keep the quilt simple. 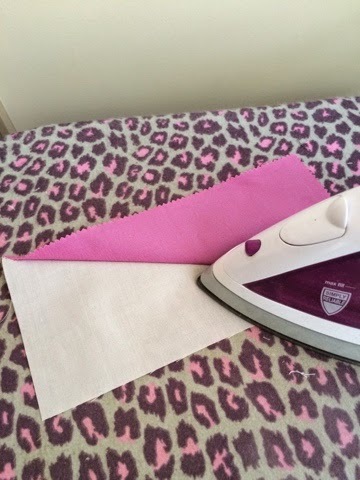 I also wanted to use every last bit of fabric that I was given. So, I decided to try something new, and I set about figuring out how to make a half rectangle triangle (HRT). I've done plenty of half square triangles, but this was new territory. I'm actually kind of shocked that I got it right on the first try! Are you ready to try something new? Ok then, let's jump in head-first! 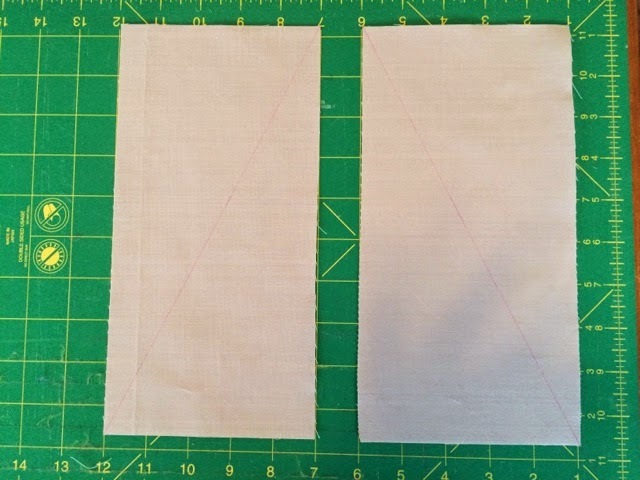 Start by pressing each 10" square, then cutting them in half to create 54 5" x 10" rectangles. 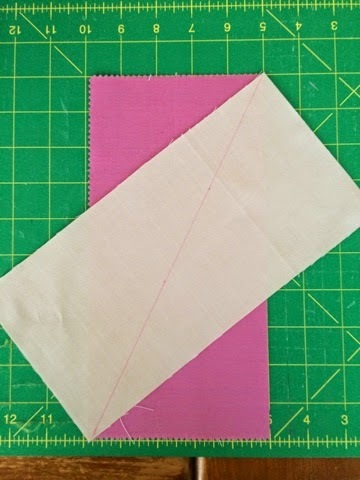 From the pressed background fabric, cut 5" strips, then subcut into 10" pieces. 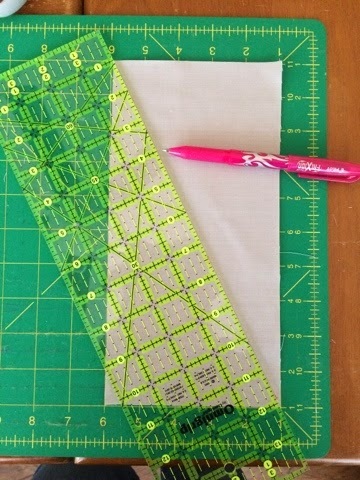 On the wrong side of the background fabric, align your grid ruler with the upper left corner to the bottom right corner and draw a line. 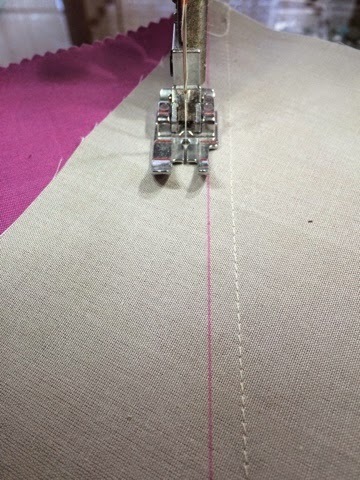 Using a rotary cutter, cut on the drawn line to separate. 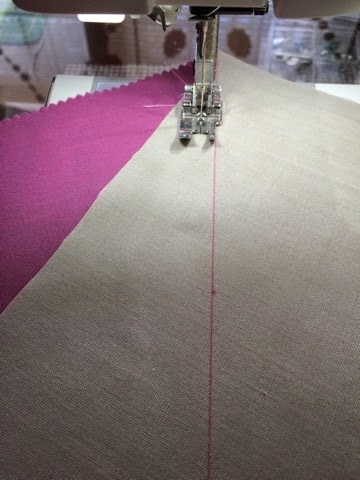 Press the HRT's open, with the seam facing the solid, or darker color. Make sure that the diagonal line is always going from upper left to bottom right, until you get to the halfway mark. Switch corners for the second half so the HRT's face the other direction-hence the name "This Way That Way". I'm afraid I don't have any graphic design skills, so you'll have to use the following photo as a layout guide for your quilt top. 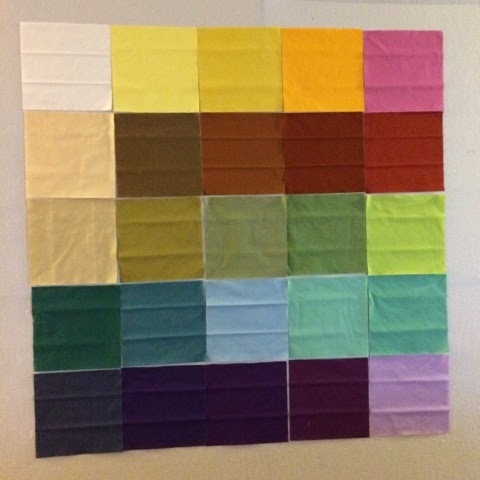 Keep in mind that there should be four HRT's of each color, but you can't see all of them on the top row because of the way it's draped against the wall. I finished the quilt by stitching one long 5" strip on either side. You will probably have to piece the strips together. 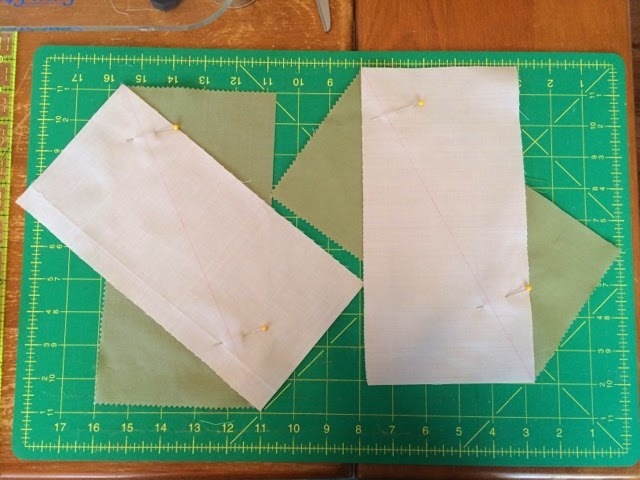 I used 5" x WOF (width of fold) and a 15" piece for each side, then trimmed after stitching. I plan to finish this quilt when I get back home from QuiltCon. I think I'm going to do a whole lot of matchstick quilting to finish it off, won't that look amazing? I'll post a finished quilt photo once it's completed, so be on the look out for that!